On the first day of Second Round action at the 2013 U18 European Championship in Croatia, four teams have secured their Division A status for 2014 while booking their place in the quarter-finals. France, Netherlands, Serbia and Spain have already passed the first serious test of the tournament by securing their place in the final 8. They now have two games to prepare for the third phase of the competition. At the other end of the championship ladder, Portugal and the Slovak Republic gained their first wins in the exhibition Group G. Portugal won their first ever game in Division A by beating England (65-31) while the Slovak Republic won against Belarus (81-60). Spain rolled over their fourth opponent with the same clinical efficiency that has characterised Spanish basketball this summer. This time the Czech Republic were the victims (45-71). Yaiza Rodriguez was one of four Spanish players in double digits with a game high 12 points. The Netherlands are also flying high at the moment. Six minutes of "Dutch Angels" basketball at its best during the third quarter were enough for them to knock out tournament hosts Croatia. Klaziena Guijt and Britt Zappeij led the Netherlands to victory (59-34) with 15 and 14 points each. In the other game Russia put one foot in the quarter-finals by beating Turkey (76-68) in the most exciting game of the day. The game was nicely balanced with four minutes to play (68-68) before Russia were able to take command. Tatiana Sema was the match winner for Russia with 14 points , 8 rebounds and the block of the match. Once again France used one quarter to destroy their opponents and then pace themselves to victory: France put themselves in control against Greece with a first-quarter run (22-10). Anna Stamolamprou was strong for Greece with 18 points. But without much help her side could not catch up. 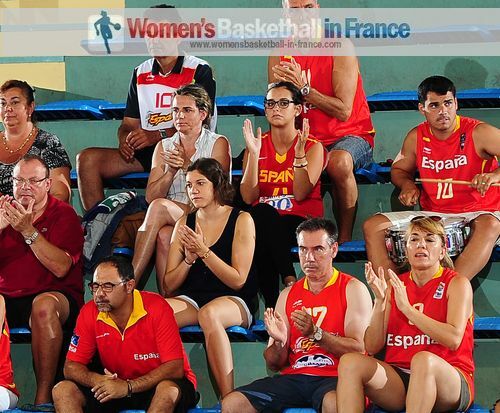 France won (70-56) with 17 points coming Marine Johannès. Aleksandra Crvendakic has been on fire for Serbia since day one of this European Championship. When also Dragana Stankovic joined in scoring, then Serbia are almost unbeatable. The two players scored 31 points in their (69-46) victory against Slovenia. Sweden are not great scorers but their defensive qualities has kept them in this competition during the first round. However it failed them during their first game of the second round. Italy allowed Sweden 16 points during the second and third quarter while scoring 36 points. This was more than enough for them to win the game (72-49). France and Serbia are certain quarter-finalists while the 2010 U18 European Championship for Women winners Italy are one win away from joining them.